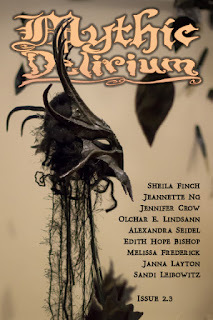 Unrepentant Scribbler: New issue of Mythic Delirium out, with a poem by . . . me! New issue of Mythic Delirium out, with a poem by . . . me! Isn't Anita Allen's cover art fantastic? In other news, my second crockpotting experiment of the week went much better. I made anafre for game day--also known as Honduran bean fondue. It's black beans, cheese, pork, with garlic, onion, and jalapeno for flavor. Mmm, good stuff. I threw everything in the pot around 11 p.m. Saturday night, on medium heat, and it was all set for the early game on Sunday. I'm taking a brief break from my radio silence since I actually have good news to share. But I'm also really enjoying the quiet, and getting a lot of reading done, so I'll probably be scarce for a while longer. Be good, and joyful, and don't hesitate to let me know if you need me.